The garden of Claude Monet has long been on my list of places to visit. 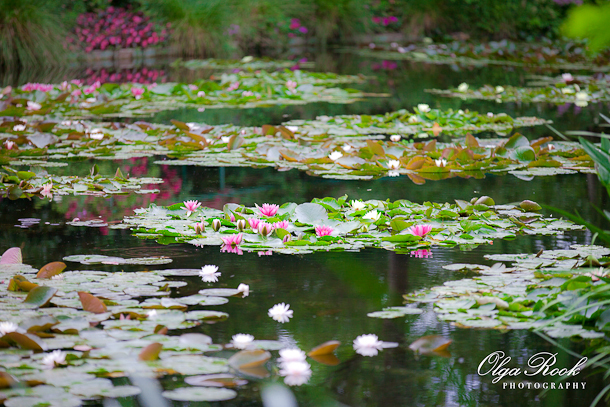 A couple of weeks ago my husband and I went to Normandy for holiday and could finally pay a visit to Giverny. 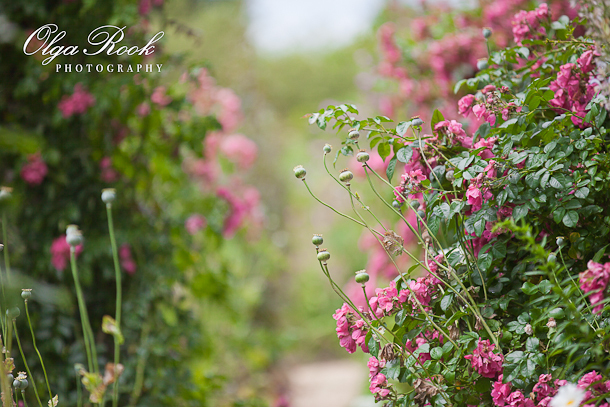 We were prepared to see a picturesque garden but what we actually saw was beyond our expectation! 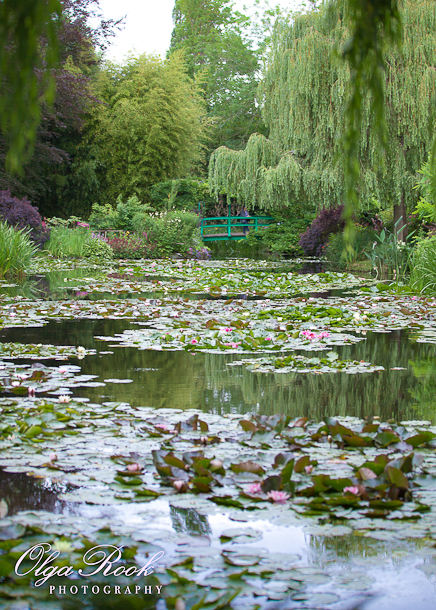 Claude Monet’s water garden in Giverny looks like this. 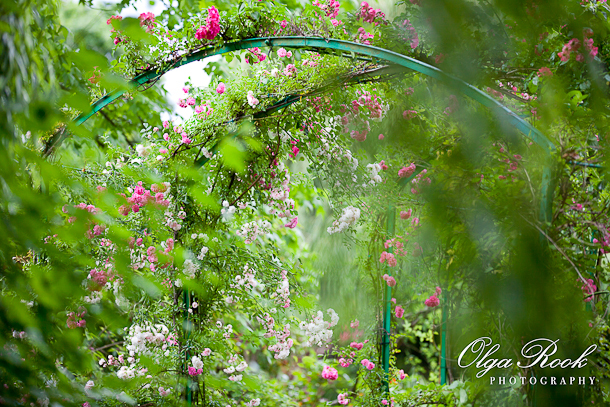 These gardens are just other masterpieces by the great artist! 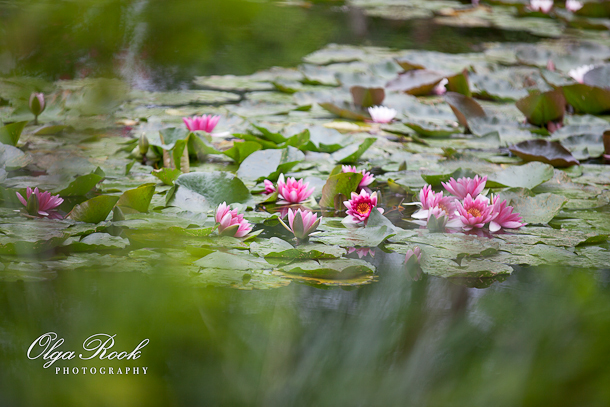 Monet had a passion for gardening and designed both his floral and water gardens himself up to small details. He lived in Giverny from 1883 until his death in 1926. All planning, layout, the choice of flowers and the way they were combined were thought of was conducted by Monet himself during this whole period. At first, Monet rented a house in Giverny and in time he was able to buy it and to acquire more land to extend the gardens. The famous Japanese water garden with nympheas was created by Monet in 1893 and served as a great source of inspiration for him. The gardens and the house experienced a period of decay after the Second World War, and were opened to visitors in 1980, after a careful reconstruction that took around ten years. It now has become a touristic destination. 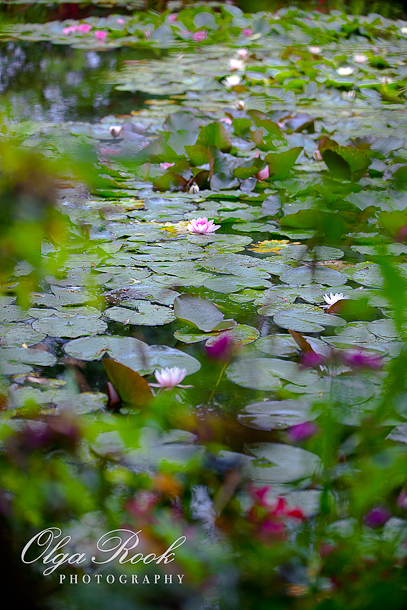 But even when it is very busy, you can still feel the spirit of Claude Monet in his garden. Did I say, “the spirit of Monet”? Well, there was a moment it seemed that the artist himself was present there. Do you see this old gentleman with beard? 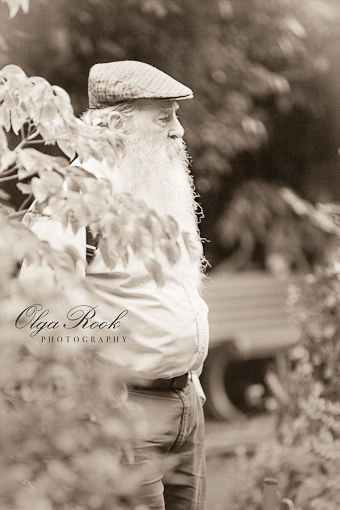 He really resembles Monet at old age. This gentleman was actually an American tourist, but his presence gave everyone a special feeling. 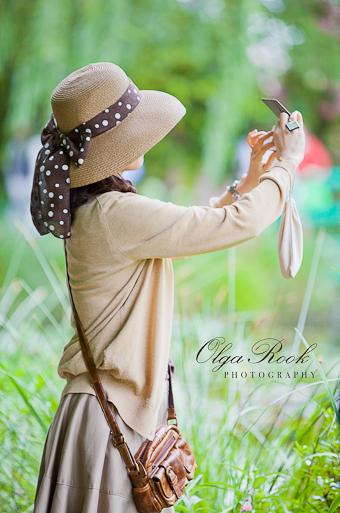 This Japanese lady had chosen a perfect hat for her Giverny visit: it gives us another reference to the times of Monet. 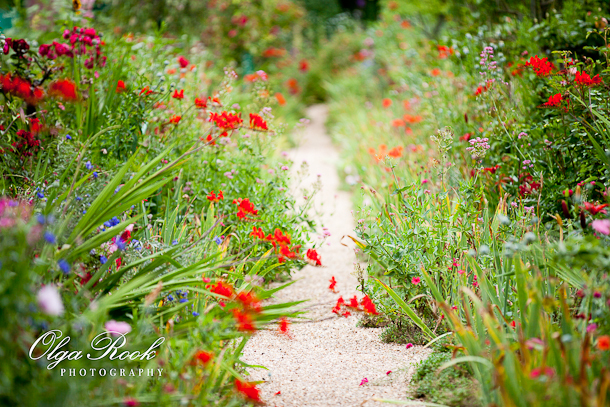 Monet’s garden is truly a creation of impressionistic aesthetic. Its combination of colors is a pure delight and felt my heart with joy. I was immediately inspired to take photographs in a kind of impressionist style. Here are a few of them. In the end my husband had to use force to take me away (we had to proceed to Honfleur, where a table was reserved for us at a restaurant). Of course, under a condition that we will come back! To achieve an impressionist effect I have used a few ideas that I want to share with you. They are simple even for a beginner with a point-and-shoot camera. In this case, there is no computer manipulation involved. In several images I have done some basic editing like contrast adjustment, but not much, and it is not essential for these tips. If you want an impressionistic effect, then you are probably looking for a vibrant play of light and colors, free “brush strokes” – rather than a wide area sharp in focus that one usually prefers with landscapes. I liked to play with focus to attract attention to just some details, allowing much of the composition to appear as blurred color and mosaic-like areas (“bokeh”, in photographers’ language). To achieve shallow depth of field (thin focus area) I mainly used a lens with a big focal length, or telephoto lens. In simple language, a lens that allows enlarging distant subjects. It has a smaller angle of view and therefore a “flatter” perspective. This makes the out-of-focus area smoother than when you use a wide angle lens. If you have some understanding of the technical side of the photography, then you know that you can also use wide aperture (small f-number) to achieve shallow depth of field. Some compact cameras have manual controls or “aperture priority” mode to choose a small aperture. However, if you use the same aperture on a compact camera as compared to a DSRL camera, the smaller camera will have a wider depth of field due to its small sensor. Spots of light and reflections naturally fit “impressionistic” effects. 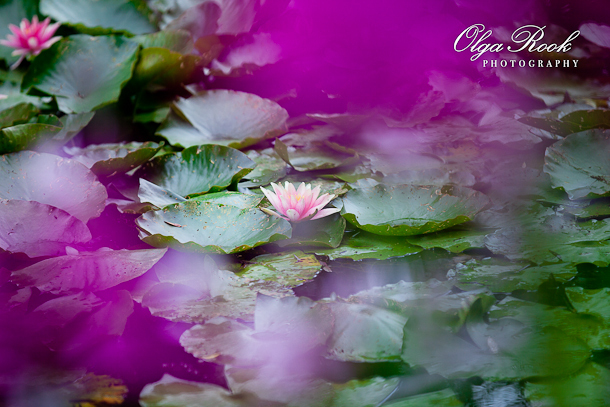 There is also a simple way to add some irregular “brush strokes” of different color or luminosity – shoot through something that is out of focus, like leaves, flowers, a curtain. 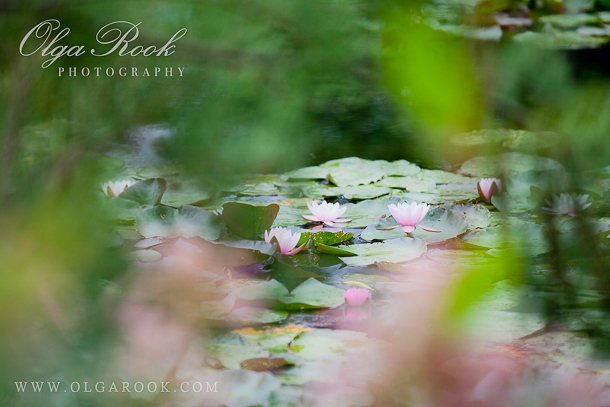 There were rather high flowers around Monet’s water lily pond, and they gave me plenty of colors for a dreamy palette. 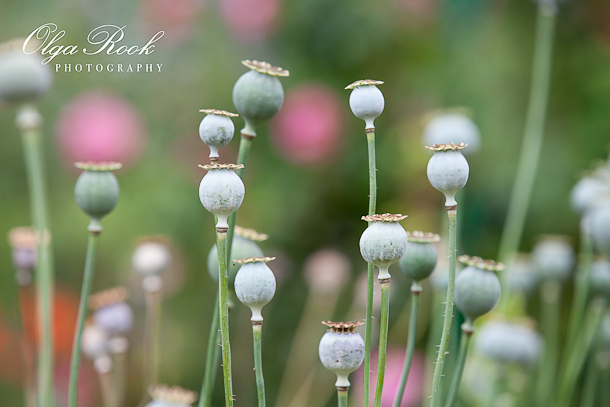 If your camera allows it, you can try manual focus for unusual focus points or for softer focus. Other ways to experiment with focus and blur could be longer exposures with some deliberate camera shake. Naturally, there are many more ways to achieve an impressionistic touch in your images, both during the shoot and in post processing. It is about a certain vision, an open composition, the usage of light and shadow. You are most welcome to share your personal tips and add your comments! Find out more about my photography workshops and one-on-one (live and distance) mentoring sessions. This entry was posted in Photography Tips, Personal.